There are endless ways to earn airline miles and this offer from Hawaiian Airlines just proves that! I’m always looking out for every opportunity to earn free travel and this offer looks fabulous! If you are looking into solar for your house as many families are these days, take a look at this offer. SunPower panels are ranked #1 in durability3 and hold the world record for efficiency4, which means more energy and more savings on your electric bills for years to come. Getting started is easy. Sign up for your free solar estimate today. SunPower is the best solar investment you can make today. Our systems produce an incredible 70 percent more energy over 25 years than conventional panels.5 And not only will you see greater savings on your electric bill year after year, you’ll also use less roof space. Which means more room to expand as your energy needs grow. Who knows, maybe there’s an electric car in your future. Take advantage of solar incentives today and receive a big 30% Federal Income Tax Credit!6 Additionally, solar can send your home resale values through the roof. A recent study in California estimates that purchasing solar can increase the resale value of your home by more than $5,000 per kilowatt added.7 That alone may help cover your system’s cost! SunPower systems are a breeze to own, no matter what climate you live in. SunPower durability is unmatched. And when you consider that just one in every 20,000 SunPower panels is returned under warranty8, it’s clear: we’re making service calls a thing of the past. 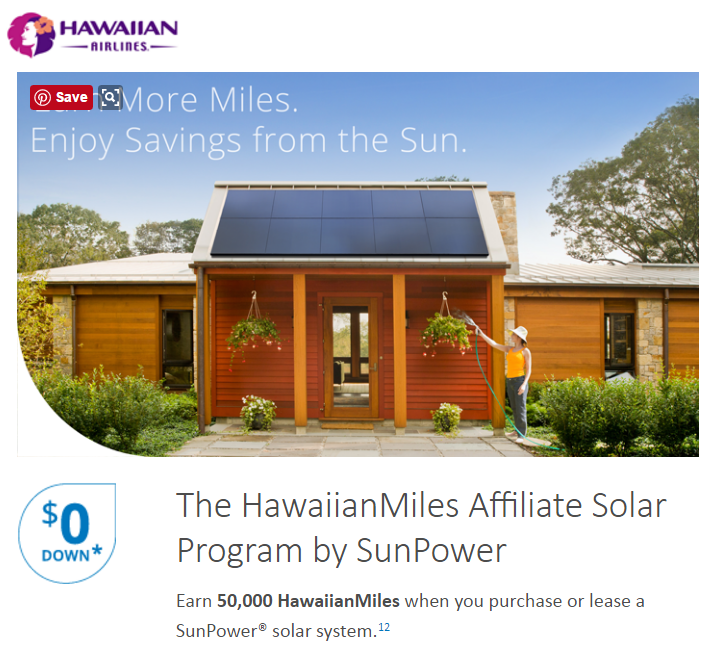 500 FREE HAWAIIAN AIRLINE MILES EARN 1,000 HAWAIIAN AIRLINES MILES WITH GILT $50 PURCHASE HAWAIIAN REDUCES MILES EARNINGS FOR AMAZON PURCHASES HAWAIIAN AIRLINES WORLD ELITE MASTERCARD – UP TO 40,000 BONUS MILES 5,000 HAWAIIAN MILES FOR 4 NIGHTS IN WAIKKI! – 36 hour sale! Hurry!